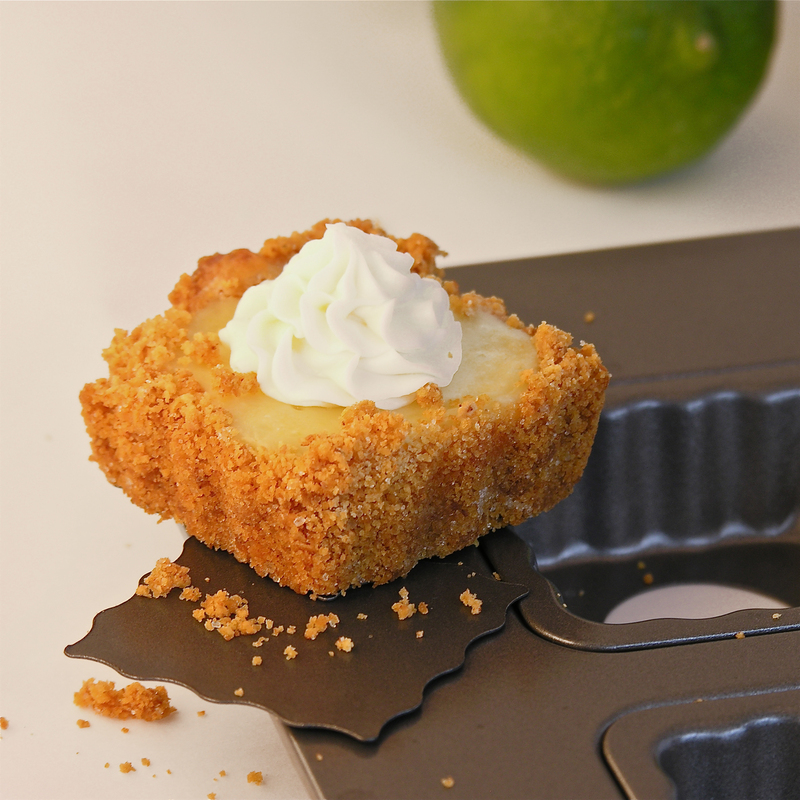 These tiny squares of graham crust filled with tart lime pie and whipped cream are a refreshing and fun party treat! Yes, I finally got the Chicago Metallic Lift & Serve Squares Pan and I love it! This recipe can be made as a plain lime pie in a pre-made graham crust (and it is really, really good)- but its just so CUTE made in these little squares– again, kudos to the creator of this pan- I love how the bottoms pop out and I’ve got so many fun ideas for this pan! **Note: this recipe makes 24 squares. Since the pan only makes 12 at a time you will need to use it twice. I wanted to halve the recipe for you, but 1/2 a can of condensed milk AND 1/2 an egg??? Just easier to use the pan twice and have 24 pieces of yumminess! Crush graham crackers into fine crumbs and mix well with sugar and melted butter. Place metal bottoms into each square opening in the pan and lightly spray with non-stick spray. 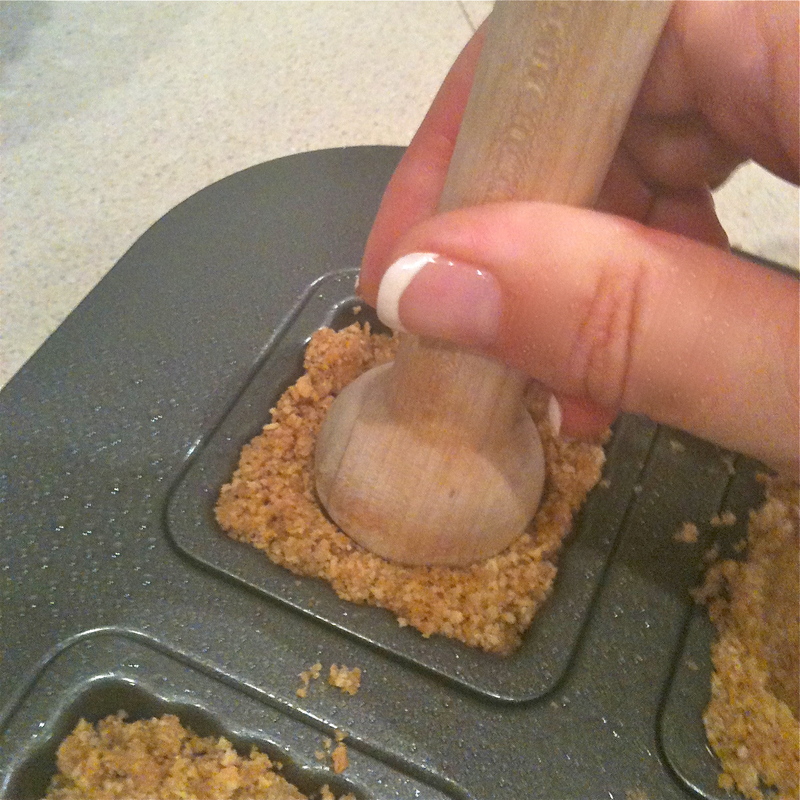 Scoop about 1 to 2 T of crumbs in each square well of the pan. (You will have half left for your next batch). 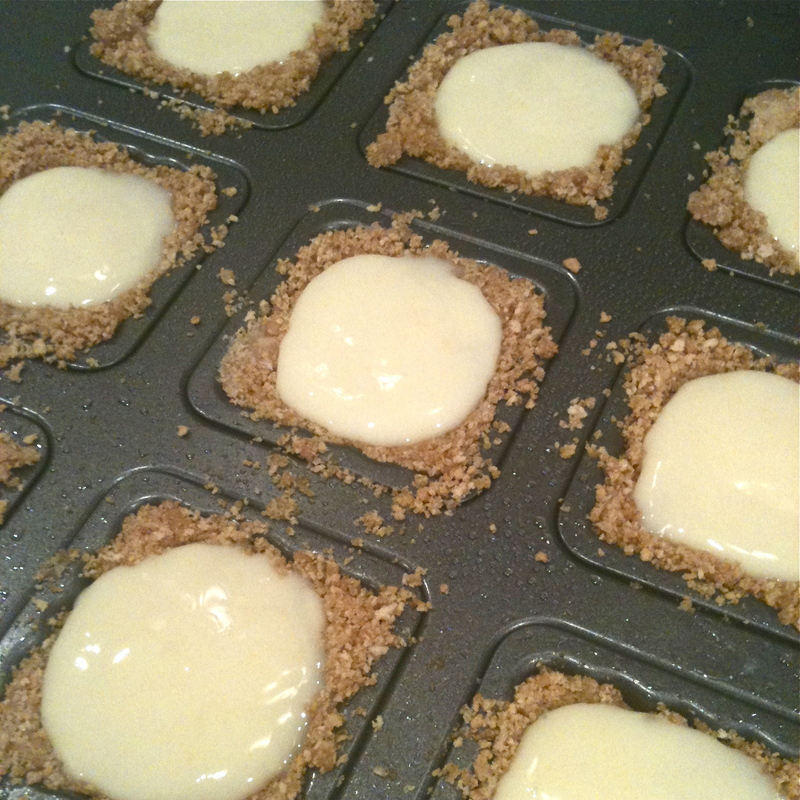 Press into bottom and sides of each square using your fingers or a Mini tart shaper . Mix together condensed milk, egg and lime juice. Spoon about 1 T of mixture into each crust (you should have half left). Remove from oven, allow to cool, carefully press up on bottom- popping square dessert out of pan. Remove metal bottom from crust. Repeat to make 24 total squares. Chill several hours. Top with whipped cream, graham crumbs, raspberries or other fruit— be creative! 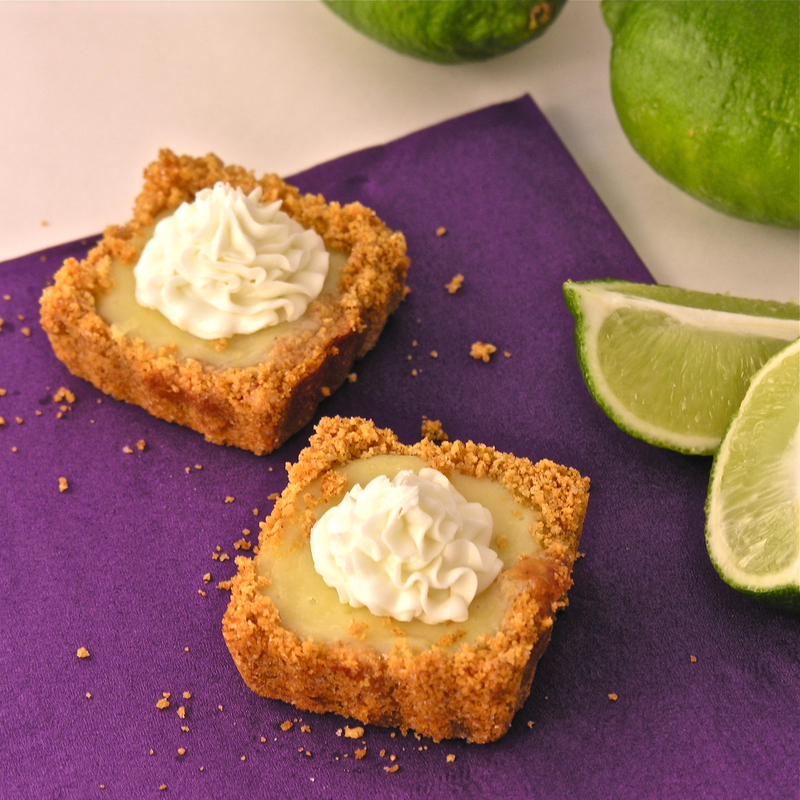 My thoughts: This lime filling is simply delicious- the perfect blend of tart and sweet. 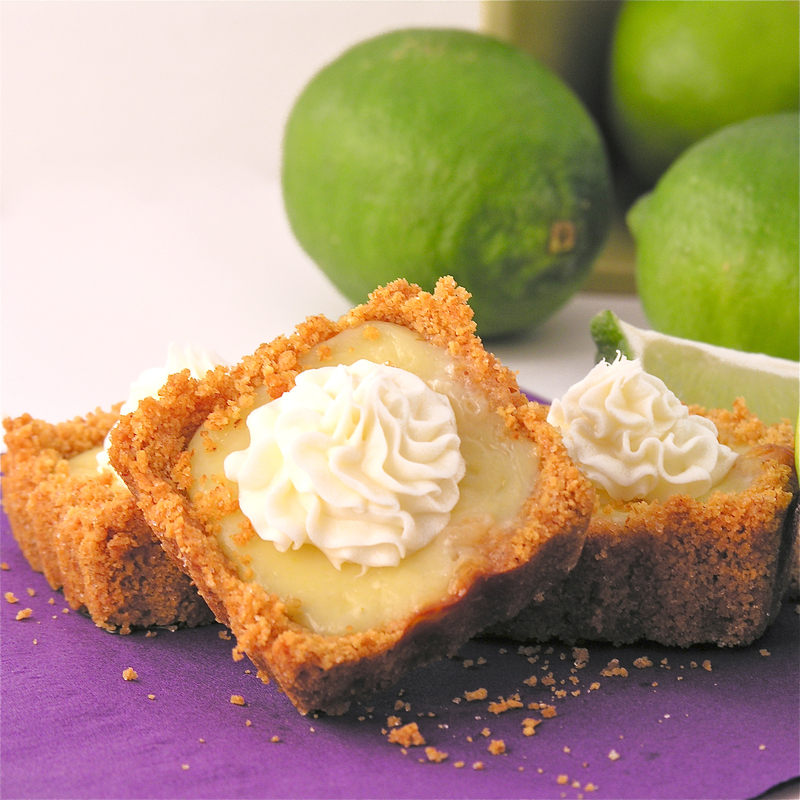 If you don’t mind the time involved, these squares are really cute– but if you just want a quick and easy dessert, buy a graham crust, double the filling recipe (2 cans of condensed milk, 2 eggs and 1 cup of lime juice). Bake for 20 minutes instead of 15 and there you have it- yummy lime pie. However you choose to make it, Enjoy! Posted in Pies, Tarts and tagged baking, chicago metallic pans, graham cracker crust, key lime, lime, mini dessert, party dessert, pies, sweets, tarts. Bookmark the permalink. More crust to filling. I’m in. These look awesome. These look so delicate and amazing! I love a lime filling too. Must say that pan looks like a must, I remember the first time I invested in a decent spring form cake tin and just thought ‘how did I ever live without this?’. OOOooooo!! I just got the round pan! I think this is the first recipe that I’ll try!!! Sounds easy and wonderful for the busy mom who works in a home studio!! I think I even have all the ingredients in the house!! Whoo hoo!! 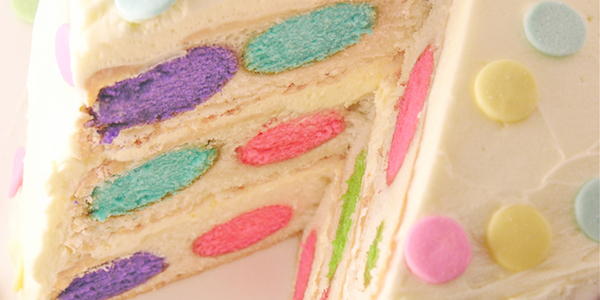 Thank you- your creations on your blog are amazing- I’m always in awe of the cake decorators of the world! Nice to meet you! Where did you get the pan? Pampered Chef??? Morning where do I get that pan? Good morning! I got mine on Amazon, but you can also find these in specialty baking/ cake decorating shops and sometimes in home stores like Bed Bath and Beyond. If you look at the beginning of this recipe, you’ll see the name of the pan in orange. If you click on the name, it will take you directly to the item on Amazon. Enjoy! Making these this weekend with a tart pan (could not find the square tart pan). Looking forward to it! What a big hit my Sweet Lime Tart received! Family loved it and I was told that it was the best dessert I’ve made! Great to make for company to! Thank you so much for sharing the recipe :-). I’m still in the marked for a square tart pan! Yay!!! I’m so glad everyone loved it! You are so welcome- thanks for letting me know how it turned out! Recipe sounds great! Would this work for lemon? Wondering if I switch out the lime juice with lemon if I could make a half recipe of each flavor & use the full egg & 1 can condensed milk? I think that’s a GREAT idea! The lemon might be more tart, but you’d have to try it to see….? this is yummy! will surely try this. cheers!